Managing operational risk management processes in a manual, fragmented manner is neither efficient nor effective. To be able to keep pace with business growth and transformational initiatives, it’s essential for organizations to implement a holistic approach to risk management, supported by a unified and timely view of risks. 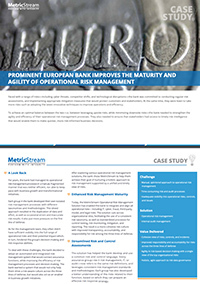 Read this case study to find out how a leading bank overcame the challenges of risk silos, legacy systems and inefficient processes while connecting assurance functions across the organizations in order to achieve process agility as well as maturity.